The larynx is a closing apparatus formed by cartilages, muscles and fibers that is separating the trachea from the esophagus. The Supraglottis, also called Vestibulum laryngis, is the upper level. It reaches from the larynx entrance (Aditus laryngis) to the gap between the vestibular folds (Plicae vestibulares). The glottis, or Cavitas laryngis intermedia, forms the middle level. It reaches from the Rima vestibuli to the actual glottic opening (Rima glottidis). The subglottis, or Cavitas infraglottica, is the lower level. It forms the space caudal to the glottic opening, and transitions into the trachea on the inferior border of the cricoid cartilage. The larynx is innervated motorically and sensitively via the branches of the Vagus nerve, more exactly via the superior laryngeal nerve and the recurrent laryngeal nerve. 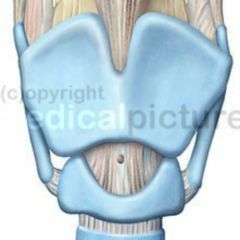 The superior laryngeal nerve innervates just the exterior larynx muscle (Musculus cricothyroideus), the recurrent laryngeal nerve all of the interior larynx muscles. For the sensitive nerve supply, the glottic opening serves as demarcation line: above the glottic opening, the superior laryngeal nerve provides supply; below, itís the inferior laryngeal nerve. 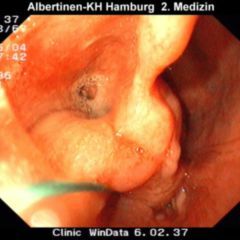 During deglutition, the glottic opening and the epiglottis are closed. This prevents the chyme to get from the oral cavity or pharynx into the lower airways.